We beseech Thee, O Lord, to grant us the pardon of our sins by the intercession of Saint Philomena, virgin and martyr, who was always pleasing in Thy sight by her eminent chastity and by the profession of every virtue. Amen. Illustrious virgin and martyr, Saint Philomena, behold me prostrate before the throne whereupon it has pleased the Most Holy Trinity to place thee. Full of confidence in thy protection, I entreat thee to intercede for me with God, from the heights of Heaven deign to cast a glance upon thy humble client! Spouse of Christ, sustain me in suffering, fortify me in temptation, protect me in the dangers surrounding me, obtain for me the graces necessary to me, and in particular (Here specify your request). Above all, assist me at the hour of my death. 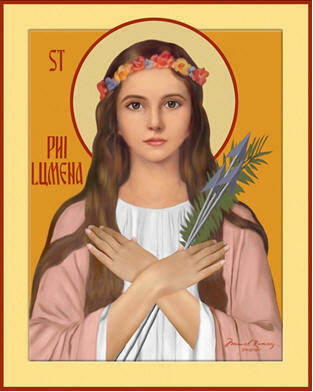 Saint Philomena, powerful with God, pray for us. Amen. O God, Most Holy Trinity, we thank Thee for the graces Thou didst bestow upon the Blessed Virgin Mary, and upon Thy handmaid Philomena, through whose intercession we implore Thy Mercy. Amen. Say 1 Our Father, 1 Hail Mary and 1 Glory Be.